This week Mandi & Chrissie of Less Is More have challenged us to a one layer creation with stripes. This week's One Layer Wednesday challenge is to use more than 5 circles on your creation. I thought and thought about making something with both challenges in mind. I decided to go for stripes of circles. 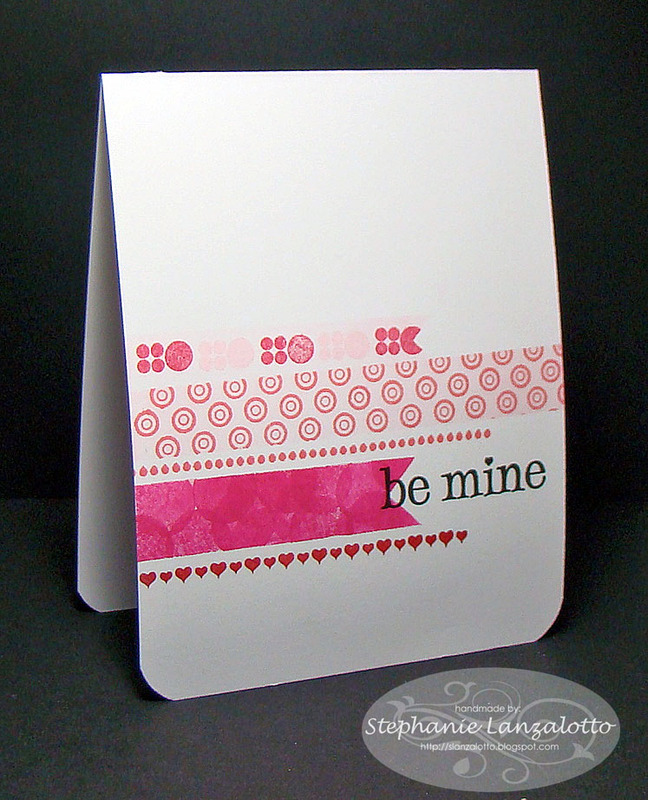 I used many shades of pink inks and various circle images on masked spaces in stripes. The little stripe of hearts on the bottom is stamped in Real Red. I like the result, but I have to say that I wish the "b" in "be mine" was either a little more to the left or to the right. I don't have the inclination to do it again, and since this is a one layer card, there are not a lot of options to fix it! The sentiment and hearts are from Verve, the rest of the stamps I used are PTI. I peeked at the creations so far in the LIM gallery. What clever creations as always! I love to see all of the different ways challenges are interpreted. I am heading over to check out more postings, then over to the OLW gallery. Thank you for stopping in on this snowy night (here in northeastern US). Love this. It is perfect for both challenges. I forgot to check less is more this week. Love all the different lengths and patterns. Are you following PTI anniversary celebrations? You should check it out--your card would be perfect for today's challenge. Love how you combined both challenges! Very pretty card! Great job Stephanie... I know what you mean about wanting things just not quite where you put them... even when using a piece of acetate for positioning, I think I've got it nailed only to find when it's actually stamped that it's a couple of millimetres off! Your card looks fab however! Love all the different patterns in the stripes. I can never manage to combine challenges! LOL! You did a fab job make a card that fits both challenges!! What a nice interpretation of stripes! I love it! Great way to combine the two challenges - beautiful and stylish card! I love your card Steph, all the different patterns and lengths look like faux washi tape! This is great, Stephanie. I love your different shades of pink and different lengths of stripes. I had a tough time with this challenge! Ann Y. A great idea. The corners and the circles on the stripes matches perfectly with each other. I love this! A great look you created here. Pretty card - love it!